Beautifully fitting into its lush landscape in the quiet charm of Victoria Park, this authentic Mid-Century Modern gem has been artfully renovated to today's standards - complete with impact glass and a full generator - while remaining true to the original design, a testament to its timeless appeal and practicality. Presented behind a row of graceful palm trees on sweeping lawns, this utterly unique home harmonizes its clean lines with the tropical environs through the use of large windows and natural finishes such as the textural sandstone accents inside and outdoors.Inside, the relaxed open flow of the airy vaulted living space is altogether strikingly modern and warmly inviting, with a wood-burning fireplace showcased in the floor-to-ceiling feature wall of stacked sandstone. The polished slate floors are another signature element of the interiors. Defined by a low wall also done in sandstone, the dining area is in turn open to the gourmet kitchen, and connects outdoors to the alluring backyard oasis that surrounds the sleek geometric pool in a resort setting with marble terraces, garden plantings, a pergola-covered dining deck, and an urn fountain. With outdoor lighting making this an enchanting realm for night-time gatherings, the pool area is also accessed from the restful master suite, one of the home's three bedrooms.Another notable feature of the property, the spacious grounds also have street access from the back, where there is garage parking in addition to a parking court large enough for four more vehicles. 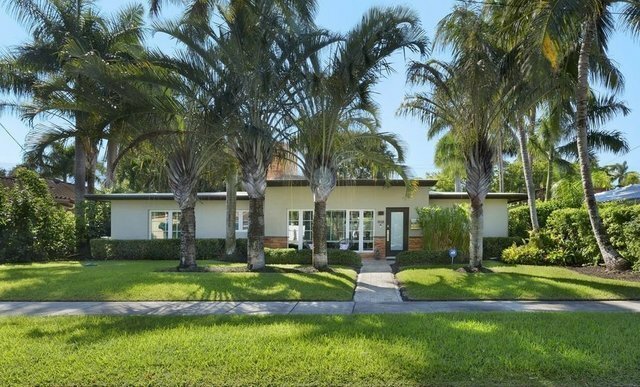 In the desirable setting in Victoria Park, just over a mile from Las Olas Boulevard and Birch Park's ocean beachfront, this exquisite Mid-Century Modern estate stands out as a rare and special find.LocationNortheast 7th Court, Fort Lauderdale, Florida. A gracious and well-located neighborhood established in the 1930's, Victoria Park is home to a scenic 93 +/- acre park which offers myriad sporting activities. Fine shopping and dining are minutes away at The Galleria and on famous Las Olas Boulevard, Fort Lauderdale's signature thoroughfare. The sugar-sand Atlantic Ocean beach of Hugh Taylor Birch State Park is only about a mile away. Also within easy reach, downtown Fort Lauderdale's picturesque Riverwalk serves as the cornerstone of the city's dynamic arts and entertainment district, home to the Broward Center for the Performing Arts and NSU Art Museum. PropertyTropically landscaped on spacious grounds, this Mid-Century Modern gem is artfully updated and meticulously maintained. Softening its sleek lines with warm finishes, this single-level residence opens to a series of outdoor spaces on the marble lounge terraces and pergola-covered dining deck by the architecturally designed Pebble Tec pool. Lush foliage adds beauty and privacy to this resort-like oasis set behind gated garden walls topped with wood fencing. The property has street access from the front and the back, where the drive provides ample parking by the garage.ResidenceThe pristine living environment is comfortably scaled in the total of 2,808 +/- square feet with open living areas, three bedrooms, and three full baths. Polished slate floors flow through all of the major rooms. Designed for comfort and convenience, the amenities include a whole-house generator in addition to impact-glass windows and exterior doors throughout. Entered from the front garden, the living room rises to a lofty vaulted ceiling in this large open gathering space where the dramatic focal point is a wood-burning fireplace surrounded by stacked sandstone from floor to ceiling on the entire wall. Set off by a low sandstone wall, the open window-lined dining space overlooks the pool area and leads out to the terrace. Separated by bar seating, the gourmet kitchen is sleekly designed with custom cabinetry, granite counters, and slate tile backsplashes. Stainless steel appliances include the Thermador gas range with oven, GE Profile refrigerator/freezer, GE Advantium convection oven, and KitchenAid dishwasher. The inviting family room/den opens between the kitchen and living room. Off the kitchen is a full bath which doubles as a cabana bath, opening to the outdoors, with porcelain tile finishes and a seamless glass shower with pebble-stone floor. The laundry room is equipped with an LG Tromm steam washer and dryer. In the other wing, the relaxing master suite opens its doors by the pool and has the comfort of its own dedicated air conditioning system. Along with a custom-fitted walk-in closet, this private suite enjoys a spa-like bath featuring porcelain tile finishes, a glass-enclosed double shower with pebble-stone floor, and two sculptural floating sinks. Two more bedrooms have another bath next to them which is finished in porcelain and glass tile. One of these bedrooms presently serves as an office.